Hi! 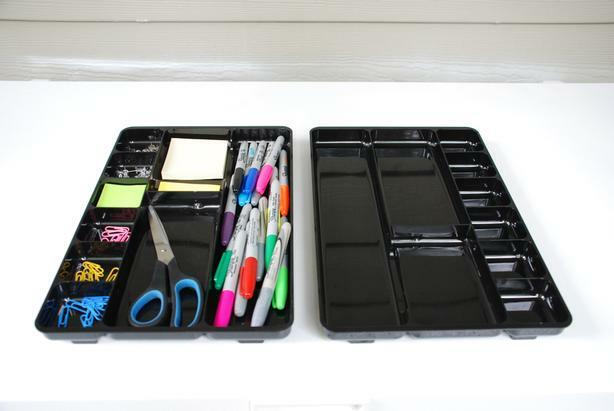 I have a pair of black acrylic organizer trays for sale. They can be used to sort stationary (pens, push pins, paperclips, and sticky notes) on a desk or in a desk drawer as well as for storing any small items in the kitchen, bathroom, or garage. There are 9 compartments (1 large, 2 mediums, and 6 smalls) with rounded corners to make small items easier to pick up. Each tray measures 14"L x 9"W x 1"H.
PLEASE NOTE: The stationary items seen in my photos are not included in this sale. I am asking $15 for both trays. I am located in Vancouver, BC but shipping is no problem. I will be happy to mail these organizers to you using CanadaPost and Interac bank transfer. So, if you are interested in purchasing, e-mail me and we'll figure out the logistics and/or I can answer any questions you may have. Thanks! #1 PLEASE do not give me your phone number since I cannot call or text you. Sorry but I communicate via e-mail only. #2 PLEASE don't bother to ask if this item is available. If you can see this ad, you can assume the item is available for sale. #3 PLEASE do not answer this ad if you have no intention of communicating further with me. So many buyers respond to ads only once and then just disappear. It's rude. If you change your mind about buying, no problem; just send a quick email to let me know that so I can move on to the next buyer. All sellers would appreciate this common courtesy.